AQ15L - G & W Machinery Sales, Inc. 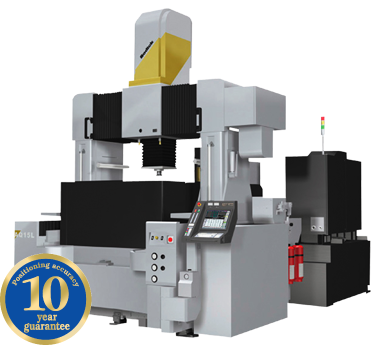 The AQ15L Sinker EDM features Sodick’s Linear Motor Technology. 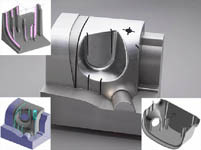 The AQ15L is Sodick’s largest Sinker EDM. This Sinker EDM is ideal for large sized molds and dies such as those used for automotive parts and large flat display panels, making it possible to fully utilize the high speed, high precision machining capability of linear motor driven machines. The highly rigid double column structure is not affected by the weight of workpieces. Linear Motors are standard on the AQ15L Sinker EDM. Linear motors provide smooth, vibration-free table movement, which results in unsurpassed positioning and machining accuracy. Since there are no ball-screws or couplings, backlash and lost motions is completely eliminated. With the use of linear glass scales on the X, Y and Z axes, precise positioning accuracy with direct feedback is accomplished. The Linear Motors come with Sodick’s 10-Year Positioning Guarantee. The New LN Series power supply unit incorporates all functions necessary for high-speed, high-precision and high-efficiency EDMing. It incorporates a CF card for data storage to enhance reliability and to save energy. The ease of operation has been further enhanced with the newly designed operation and control panel, which provides touch-screen operation and LAN function. The LN professional automatic programming system offers a wide variety of machining shape patterns that can be used in various kinds of machining. The AQ Series features energy-saving designs and technologies. Compared to conventional EDMs, the Sodick Sinker EDM Range can reduce average energy consumption by up to 60%. The SVC Circuit is standard on the AQ Series Sinker EDM. It enhances the cutting speed (finishes) by 2-4 times, provides a uniform discharge pulse to the polarity. The surface roughness has largely improved as well as boosted the machining speed. The AQ15L’s workpiece take is independent from the machine drive to maintain machine accuracy and avoid influence from the workpiece. Situating the Z-Axis on the machining axis assures quick reactivity and high precision with a gantry construction design and no overhang.